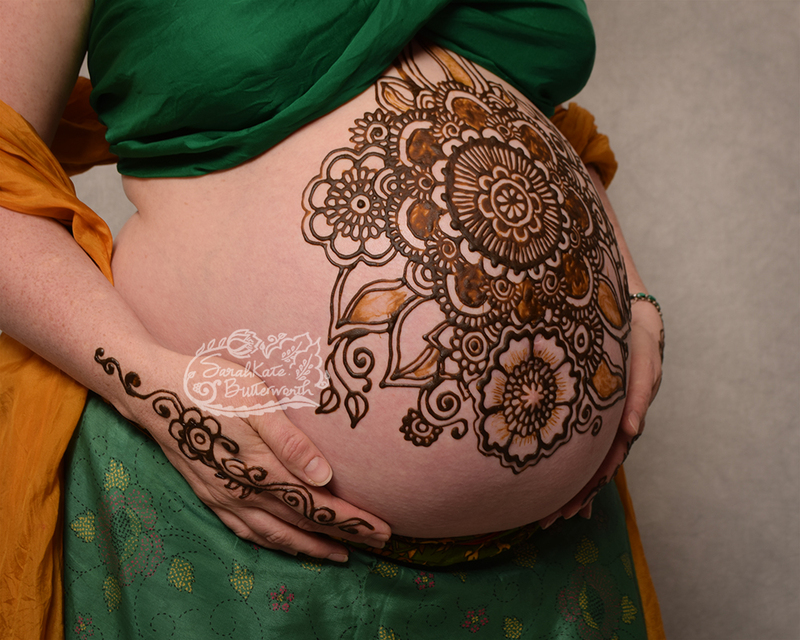 Last December I had a really special couple come in to celebrate pregnancy together with henna. 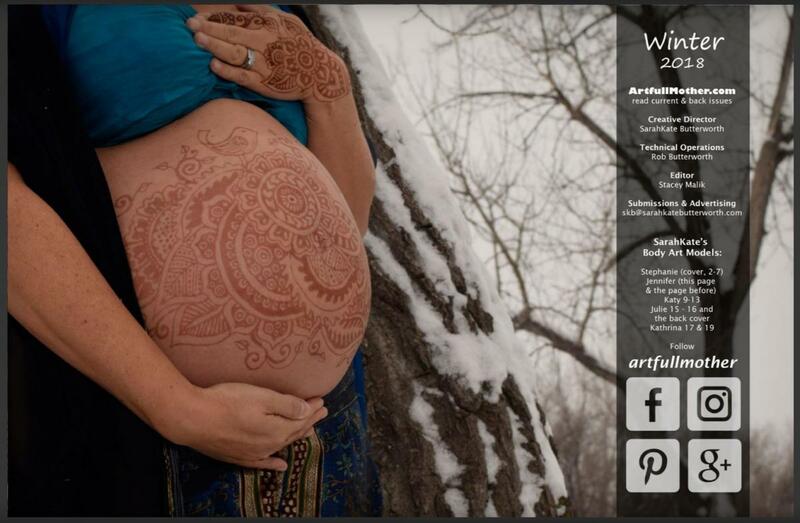 When we first start talking about her appointment, this lovely new mama looked online for inspiration and found an image of a woman and husband covered in body paint, with a tree that grew over the mama's belly and over the dad's arm as he held her from behind, with his arm covering her breasts. It was gorgeous how the branches of the tree connected solidly from the mama's belly to the dad's arm and then back to the mama's chest. I listened to her other ideas for design elements... there were many that we explored! We incorporated a sense of dahlias, tiny baby footprints and the swirling flower element she's seen in my earlier work on my website. Below is some photos that inspired this work, it's from 2012! I remember this mama fondly... she was planning to name her daughter Zinnia and wanted me to cover her belly and chest in zinnias. I loved how this henna ended up connecting this couple, an artistic representation of their growing bond, their growing family. So wonderful to get to know them and witness their deep love for each other. They were also pretty creative in the photo session! We went through a bunch of poses ... it's really fun to keep changing colors and trying new ideas. The couple returned a few days later when the henna was peaking in color and we had another photo shoot. The weather was pretty cold that week so all the photos were taken inside, where it was warm enough for some shots with less silks involved.... photos to remember! 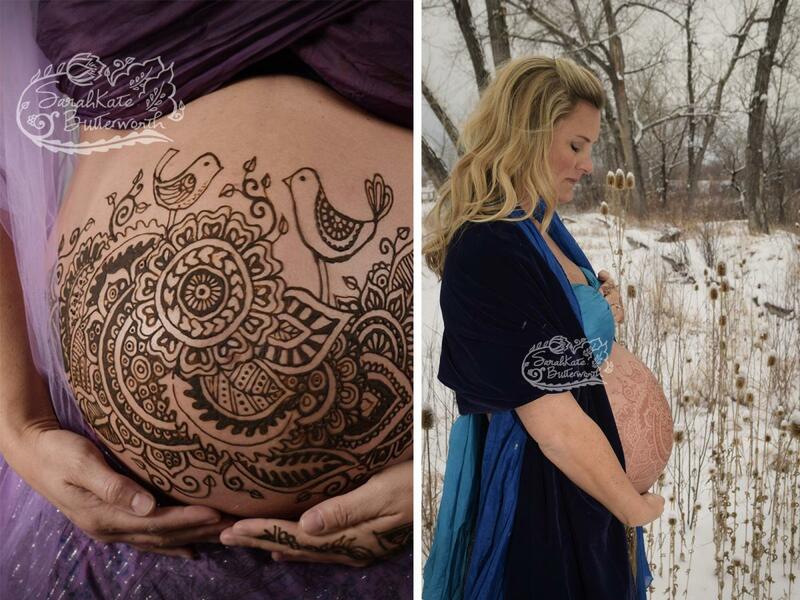 I first met this mama in 2015 when she came in for nursing henna and photos. It was great to catch up with her again and met her new baby! He is just 2 1/2 months old and so adorable.... more photos of him later! The design started with a request for the tree of life, the Acacia tree. As I looked through my pile of inspiration she spied some giraffes and requested that they were included. And so the art began! 2 hours later I was blow drying her. The nursing session was about a half hour, and we got a lot of GEMS! 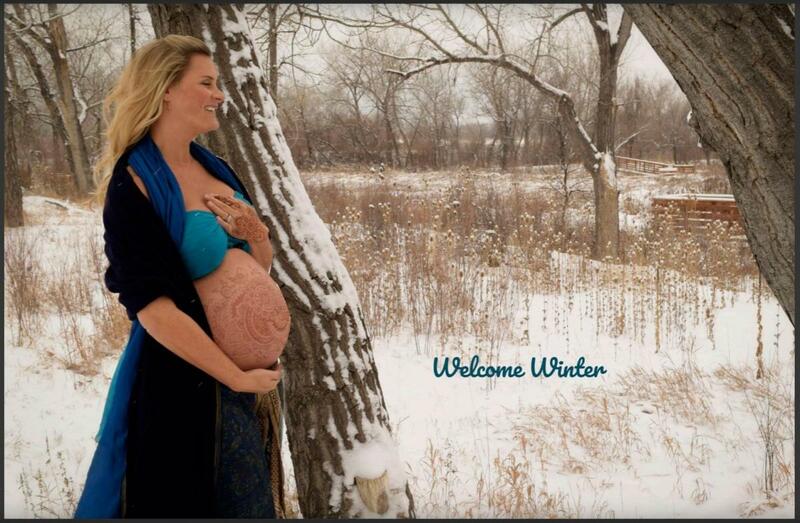 It is so powerful to witness the act of breastfeeding. Today's henna art was a 2 hour chest piece, stretching from shoulder to shoulder. Design request included her totem animal, the wolf. This art is part of my project about Sacred Femininity and I was thinking about showing this aspect as I drew out the wolf with henna. What a powerful ally! Many animals were discussed to potentially include, and in the end, I added 3 more birds, including crow. It feels so powerful to adorn women with their spirit animals and hear the stories behind why it's important to them. This amazing woman has lived in Boulder for 20 years and we honored the love of Boulder and outdoors with a depiction of the Flatirons among the flowers. As is true with many people in Colorado, we both feel a strong tie to the ocean and I loved included waves of water in the design. Recently this cute baby photo came up in my "memories" on Facebook and sent me on a journey of reflection! This image was taken 9 years ago when I was just starting to get serious about photography. This art project has brought my life such meaning! Even though I have completed that series (with 6 volumes) and created a magazine focused on motherhood with 13 issues (Artfull Mother) I know there is another pregnancy & baby book in my future.